We love our pets! Altogether, Americans own almost 90 million dogs. Keeping your home clean can be challenging when you have one dog, but it can be absolutely infuriating if you have more than one pet. The budget-friendly tips provided here can help you stay on top of any pet hair, dander, saliva, and odors you may encounter. Change your home’s air filter regularly, more often than recommended by the HVAC unit’s manufacturer. Most homes need a new filter every 90 days. If you have a pet, you need to change your filter every 60 days. If you have more than one pet, that number drops to about 30 days. Consider using filters with a MERV 13 rating. FilterBuy.com offers a large selection of MERV 13 filters that block almost 100 percent of pet dander and many other common household pollutants, including smoke, dust, and mold. You’ll feel better and so will Spot. Brush your dog weekly or even daily. Most dogs enjoy this routine, but if your dog balks about it, ease her into it by using a gentle brush and start with a less sensitive area. With a small time commitment, you can cut down significantly on hair flying around. Designate some towels as dog-only towels for wiping up saliva and muddy paws, and wash those separately from the family towels. Those towels can get smelly, so use a good detergent and add some extra boost with a DIY oxygen cleaner. Wash bedding often — yours and your dog’s. You may believe that your dog doesn’t sleep on the bed when you’re gone, but do you know for sure? If you have large dog beds, you may need to visit a laundromat to get them clean. Consider getting covers for those large beds to make them easier to clean. 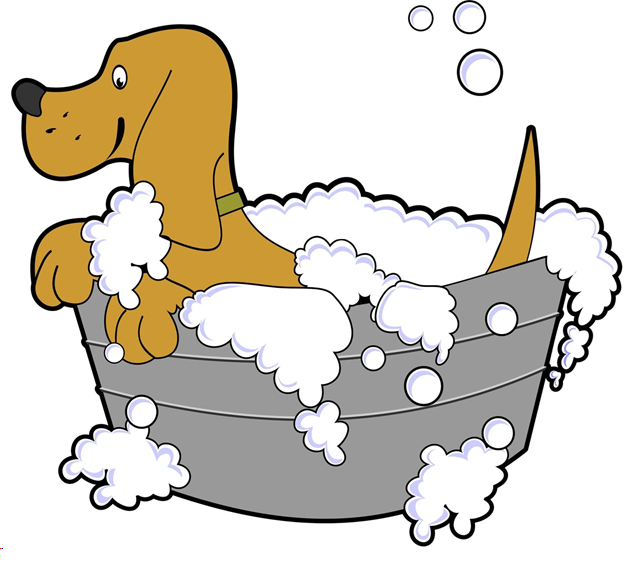 You can also use your bathtub to wash a large dog bed. Laundering curtains can be difficult and time-consuming; you have to take them down and hang them back up, and that’s a pain. This is a place people often forget about when it comes to keeping the home clean, but if Fido’s favorite spot is by the front window, you have a hair problem on the curtains. You can try using a lint roller or rubber gloves to remove the hair. If you have lots of curtains, you might consider replacing the curtains with something easier to clean, possibly short curtains, a valance, or blinds. Vacuum regularly as well. If you have a long-haired dog, you may need to commit to vacuuming more often, but a weekly routine is probably sufficient for most dog owners. If you have kids, encourage them to help with this task. Be sure to clean your vacuum’s filter often as well. If it’s time to replace flooring, consider putting down hardwood or laminate instead of carpet. Sweeping up dog hair can be easier than vacuuming carpet; this also helps with allergies. You know your dog will have accidents in the house. Be prepared with a spray bottle of pet odor treatment, one from your local pet store or a DIY treatment. Blot the spot with paper towels, and spritz with your spray cleaner. Let sit for around 15 to 30 minutes, and blot again. A second treatment may be necessary to completely remove the evidence. Setting up a cleaning routine may be the only way to keep a clean space when you have pets running around. Post a calendar on the fridge to keep track of all the areas that need regular upkeep. Staying on top of the cleaning means you don’t have to do a deep cleaning as often. What’s more, your home will be fur-free and clean-smelling.